Step 1: Level the area where you plan to place your barrel. We suggest placing a few cinder blocks or bricks to elevate your barrel slightly. This will help improve water flow, allow you to easily fit a watering can underneath, and reduce the amount you need to bend over. Step 2: Mark the downspout an inch or two above the top of your barrel when it is at its desired height. Cut the downspout at the mark. Snips may be used on aluminum downspouts and a hacksaw easily cuts through plastic downspouts. Step 3: Fit the newly shortened downspout with an angle piece and an extension, if necessary, to allow the water to discharge onto the lid of the barrel. You may be able to use the bottom of your downspout if it contained an elbow or they can easily be found at most hardware stores. Keep the removed portion of your downspout allowing you to easily reassemble the gutter in case you ever choose to more your barrel. Step 4: Attach a length of garden hose to one of the overflow ports, located on the top side of your barrel, and direct it to where you would like any excess water discharged. Now your rain barrel is set up and ready for use. Enjoy! 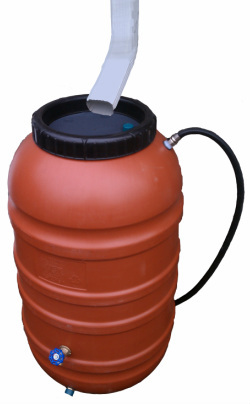 * You can use the water your rain barrel collects to water you garden, lawn, and potted plants. DO NOT drink the water collected. * In the winter you can drain your barrel and store it in the garage, just replace the bit of downspout you removed when you installed your barrel. If you are leaving your rain barrel in place during the winer, drain the barrel before it freezes and attach your overflow line to the bottom drain. This will allow excess water to pass through the barrel. Please be sure to have the hose discharge in an area that is not used by foot traffic to avoid creating an icy hazard. Camels Hump Rain Barrels are designed with brass fittings on the lower half to handle some freezing and thawing. * If your barrels are full and you are expecting more rain, use the water in your barrel to wet down your lawn. This will increase your lawns ability to absorb rain while creating more space in your barrel; all ways to help reduce storm water run-off. * While Camels Hump Rain Barrels are dark in color and therefore minimize algae growth by preventing sunlight from entering your barrel, if the water stands for awhile during the hot months it MAY develop a slight odor. If this occurs, add a cap full of bleach to the water. It will not harm your plants and should eliminate any smell. If you take your barrel in for the winter, use that time as an opportunity to wipe down the inside.